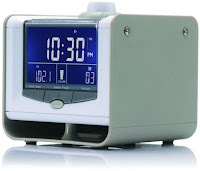 The Neverlate Executive alarm clock is probably the closest clock we've seen to a computer. It can't help you write a letter or play Simcity, it's true, but it has so many alarm settings and modes that even the fussiest sleepers we know couldn't fault its thoroughness. The clock is a fairly small device, shaped like a cube and five or six inches around each side. There's a bright, clear white-on-blue screen at the front, with a time reading in bold digits, along with the radio setting and alarm mode readouts below that in smaller digits. The radio can tune into both FM and AM broadcasts (but not DAB digital radio). It's easy to tune, with an auto-seek function accessed from the buttons on the front panel. The volume controls are here too, although they're symmetrical with the tuning buttons so the 'volume up' button is counter-intuitively to the left of the 'volume down' button. Radio quality is good, although that depends ultimately on reception in your area. There are 20 presets for stations, either FM or AM. The alarm settings are a bit more complex. There are three sets: the first is a daily alarm that goes off, obviously, every day. The thing is, there are seven of these daily alarms, so if you're a particularly heavy sleeper you can set up to seven of them to progressively wake you each day. Alternatively, if you like to vary your sleep patterns week-by-week, a simple flick of the dial on top will switch the daily alarm from one time to another. Then there are two seven-day alarm clocks, a different one for each day of the week. We've seen plenty of clocks with separate weekend settings, but this is the first we've seen with different settings for each day. That's useful if you work odd days or shifts, so you can set it exactly to your liking. Alarm sounds are pleasant enough, and it can be set to wake to the radio as well. It all sounds – and is – fairly complicated, but the manual is well-written enough to take you through it simply, and the two dials on top of the clock are fairly easy to use. There's also an input for a portable music player as well as, for some reason, a USB port to attach a USB lamp or fan (but not a computer). In all, it's expensive, but for fussy sleepers the Neverlate Executive is worth the money.